September is the start of the the nut season and the hazelnuts are nearly ready. I asked keen forager Christopher Robbins for his tips on identifying and harvesting nuts. There are five edible nuts that grow in the UK but only three are worth the bother: hazelnuts, sweet chestnuts, walnuts. The hazel tree grows all over the UK, especially in England where it used to be coppiced for the versatile wood. The ‘cobs’ or nuts are produced in small clusters of 2-4 appearing in late summer. They are best picked early when still immature as many animals also love them and will be first to strip the trees unless you are vigilant and quick off the mark. They are delicious when very young and can be stored for several months. Sweet chestnuts are popular Christmas treats in Britain, but are also interesting collected when they fall from the trees and eaten fresh and raw. The common horse chestnut or conker is NOT edible so make sure you can tell the difference between the the two types. The sweet chestnut is covered with a fine, green and prickly coat looking rather like a tiny rolled-up green hedgehog. The inedible horse chestnut has a smooth green coating with scattered spines looking like small, green antisubmarine mines from World War II. 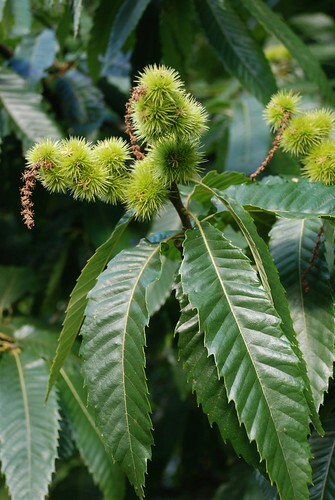 When fresh, the outer brown skin of the sweet chestnut fruit can be split carefully with a pointed knife and peeled away to reveal the wrinkled nut beneath. This is covered by a hugging, furry membrane that can be peeled away, so the nut can be eaten. It is delicious, crunchy and a very satisfying snack on a foraging walk. The mature nuts are tougher and have to be cooked before eating. Walnuts are not native but you can find the occasional tree that has gone feral. Sometimes you will find trees on farms or in private gardens and the polite ask may grant you the privilege of being able to collect some treasure. Freshly fallen walnuts are known as ‘wet’ nuts. They are excellent eating but don’t keep well because the fleshy kernel inside is not yet mature and dried. Commercial nuts are artificially dried and will keep longer. The remaining two edible nuts are less exciting but worth considering by the perfectionist forager. Acorns are best fed to pigs, as they used to be in centuries past, but they can be roasted and ground for a caffeine-free coffee just as chicory root used to be. The nuts of beech trees, called ‘mast’, can be eaten, but are usually so small and such tedious work to extract from their tough outer coat that only an obsessive forager would try. Their flavour is so uninteresting that they are unlikely to be tried a second time. Hi Christopher, I’ve found an almond tree in my local park in Edinburgh. The almonds are very tasty but I have found some worrying reports of wild almonds being poisonous. I assumed almonds weren’t native to the UK and so could not be “wild” but have been unable to find anything conclusive. Any advice? Hi. Can anyone advise. My husband and family own a farm in Hertfordshire where we have felled a great deal of conifers and where we would like to create a nut forest. Thinking mainly of hazels, and maybe walnuts and sweet chestnut. I believe the warming climate means walnuts are becoming a borderline viable tree to grow. They need a well draining soil and plenty of light to avoid frosts and maximise growing season, therefore a south facing, un-shadowed spot would suit. Late frosts will destroy harvests so investing in different varieties of trees (with different flowering times) may help mitigate this. Although many varieties are self pollinating having a diverse range of varieties, including specific pollinators, will also help with pollination. Squirrels will eat all the nuts, a slippy shield on the trunk and making sure adjacent trees are not close enough for them to travel between could help. 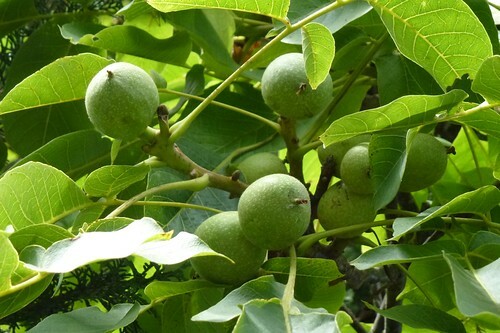 Walnuts are known to be allelopathic (they release chemicals inhibiting some other plants), planting with nitrogen fixing nurse species (Italian alder/wild cherry/olive…) can help(https://academic.oup.com/forestry/article/81/5/631/523709). Good luck with your plans, I hope you will find this helpful. Perhaps your farm will become a case study of how to create an English nutwood.